You might know that some of the basic elements your senior fitness workout program should include are weight training, cardio activities, and as much flexibility as possible. 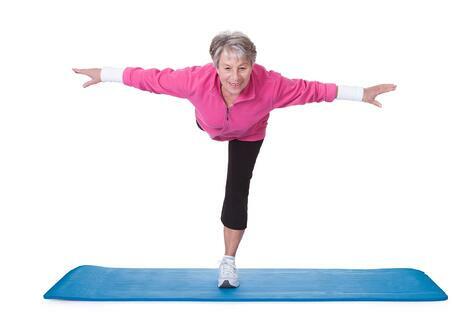 One element that needs special attention among the senior population is balance training. Training for balance has been considered a fourth recommendation from many organizations, and there has been a much bigger emphasis on balance training in senior wellness programs in recent years. With balance training now a part of a strong recommendation for your daily workout routine, where do you start? What is balance training? These questions are pretty common among seniors, and the perfect place to start is with training. Following are some tips for starting and maintaining your new balance program—that is, if you have not already been working on balance. Even if you feel like you are pretty surefooted, start light and use something to assist with your balance activities. Anytime you work balance, you are using muscles in your body that may cause your balance to become shaky. Once you are more acclimated to the balance activities and you are comfortable with progressing, try slowly releasing the assisting device or object to get more challenge from your balance activities. Anytime you start an exercise program, consistency will be important. The same rule applies here. When working on your balance, maintaining a three-day-per-week or five-day-per-week schedule will add up in no time. Consistency will train your mind, body, and muscles to improve your balance over time. Again, when working on balance, be cautious with your modifications. Start with light modifications and progress with different activities. For a good list of modifications and additional balance exercises you can add to your balance program, click here. Scaling a workout is something that many do, and when working with seniors, scaling is important. When you scale your workout, you are essentially changing something to make it more individualized. In other words, if standing on one foot is too easy for you when holding on to a sturdy chair, you should scale, if appropriate, by trying a single-leg stand without holding on to the chair. Starting your program should be slow. Start with about one or two balance exercises and progress as you feel necessary. Starting slow will progress you into a good program, but it will also help you take it slow (just like in other aspects of your training). When you start your balance program, hold your balance activities for about 20 to 30 seconds in each position and aim to complete about two or three sets. For a good amount of exercises and demos, consider the information here to help get you started on new balance training exercises. If you have any additional tips that worked well when you started a balance program, please leave some helpful hints in the comments below. If you found some things to work and others to not, we would like to hear your experiences. Interested in how we provide balance training for seniors? Check out our whitepaper, Advanced Balance Training Programs for CCRC Fitness Center by clicking below.